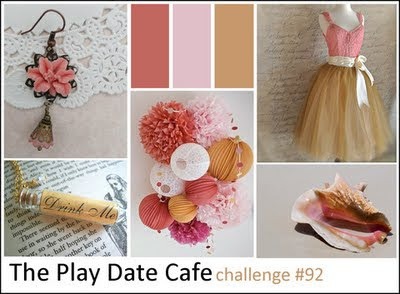 This is the first time I have played along at The Play Date Cafe and was drawn in by the beautiful colour palette and the desire to re-visit the Polished Stone Technique combined with the Presto Pattern Speciality DSP. 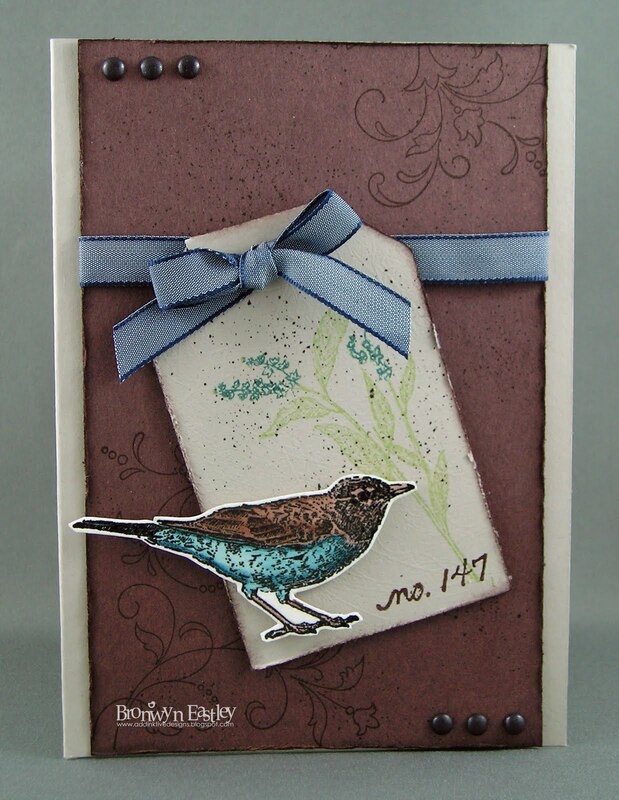 I was limited by my stash of re-inkers so the colours aren't as pretty as the ones in the gorgeous inspiration collage. 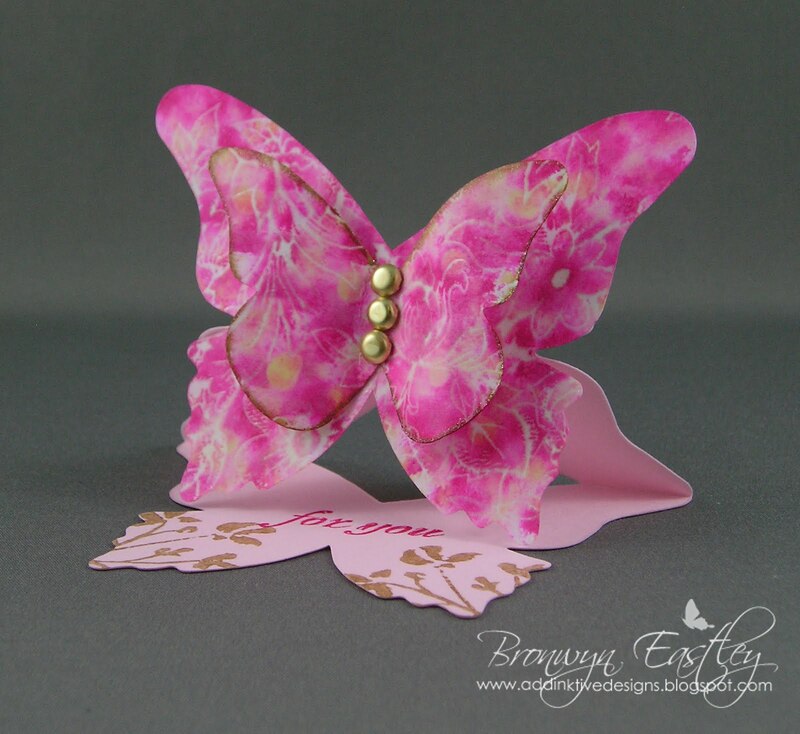 I needed to do a Butterfly Easel Card as a swap for a friend who I met at Melbourne Convention and I wanted to make this one a bit different to the previous line up. 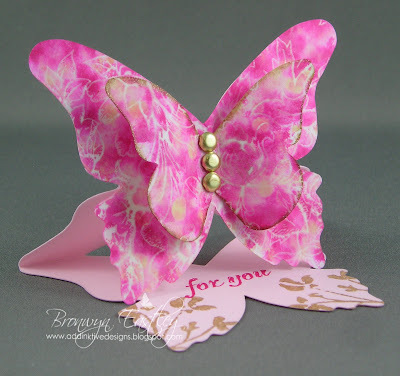 The base of the card is cut from Pink Pirouette card stock, stamped with a sentiment from Fresh Cuts in Melon Mambo and the 'stem' stamp from the L2 Hostess Set, Love and Care, is stamped with a mixture of Champagne Mist Shimmer Paint and Soft Suede re-inker to make the antique gold colour. 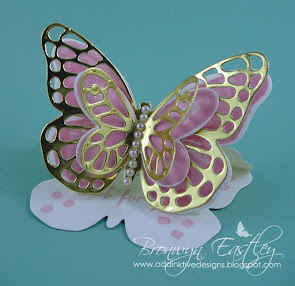 The top butterflies are cut from Presto Patterns Specialty DSP and dots of Gold Re-inker were placed over the butterflies and then dabbed with a cotton wool ball that contained rubbing alcohol (Isecol) and a drop of Melon Mambo and Pink Pirouette Reinkers (for the polished stone technique). 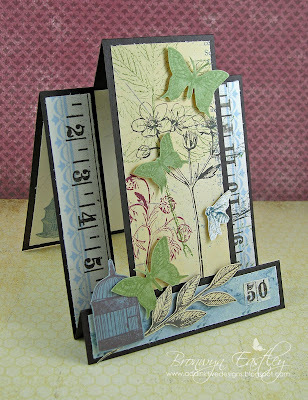 I've discovered this technique doesn't really work that well on card stock other than Glossy White. 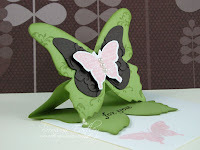 The end result didn't quite go to plan but it looks pretty anyway. 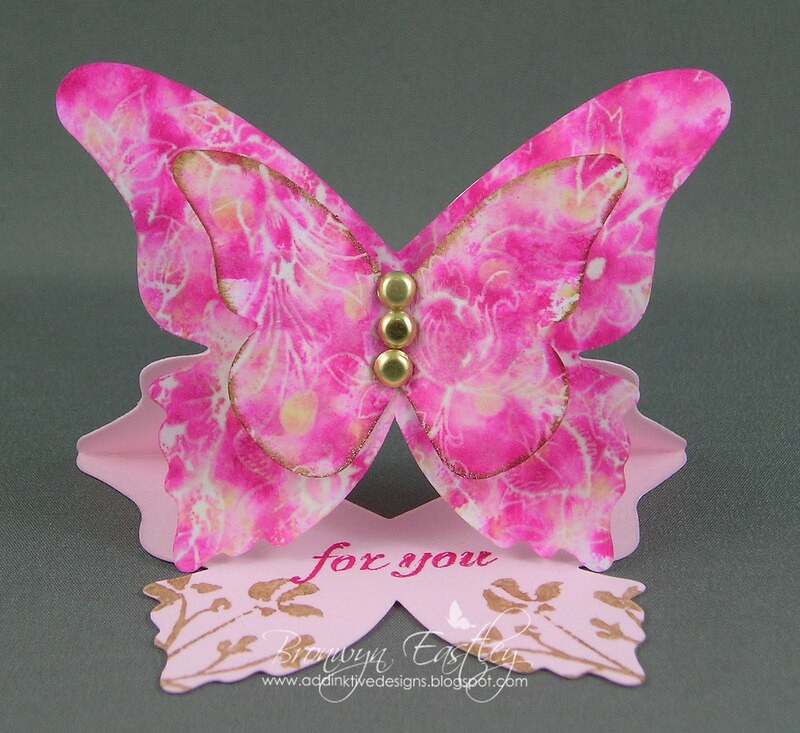 I sponge daubed the edges of the smaller butterfly with the Champagne Mist Shimmer Paint and Soft Suede mixture and added 3 Gold Brads to finish it off. 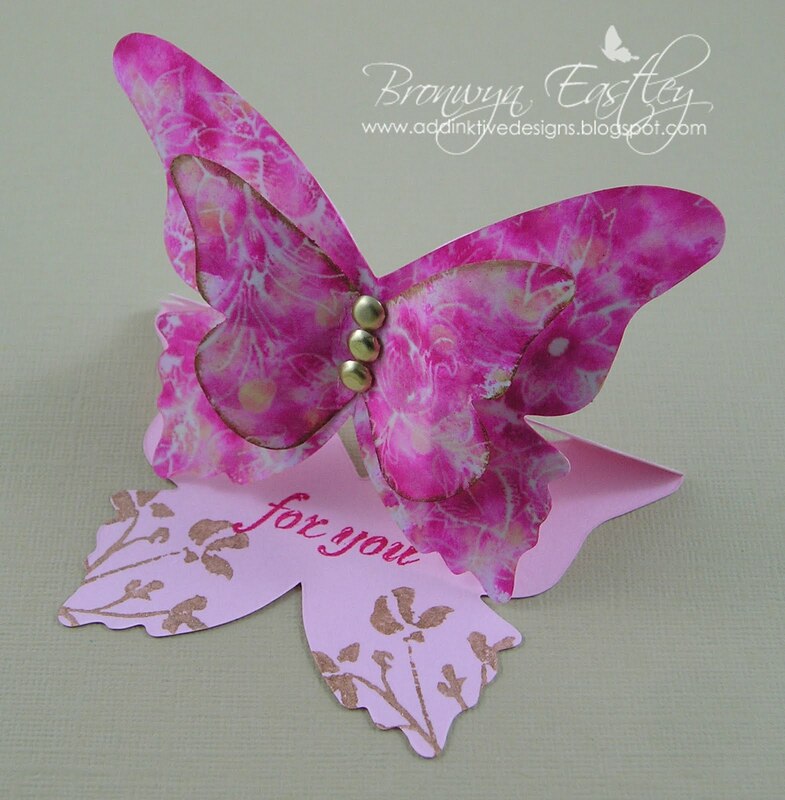 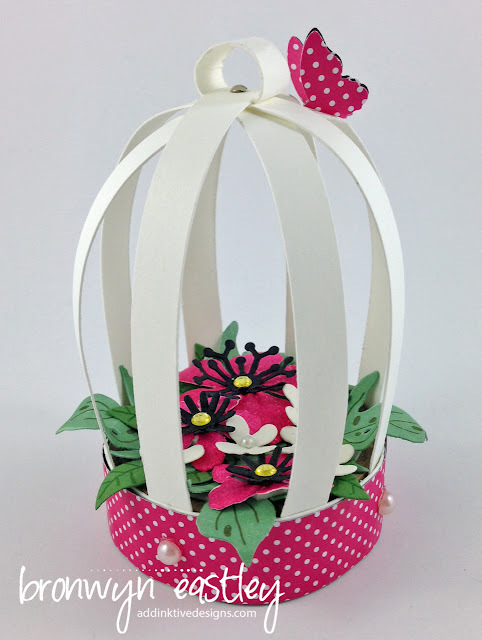 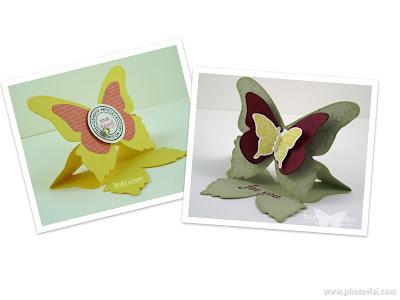 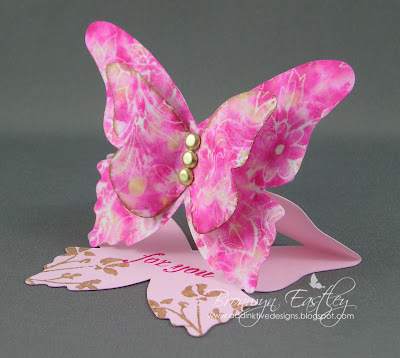 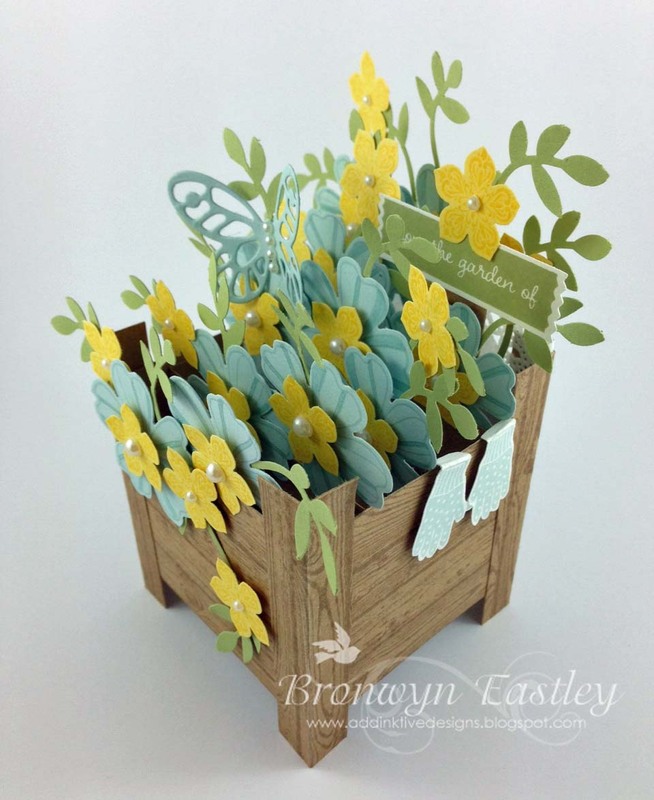 You can find my Butterfly Easel Card Tutorial HERE. 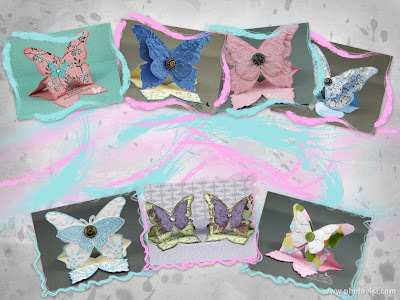 I can hardly believe that it's two years ago today that I started my blog, so I thought I'd leave you with a collage of a few of the versions of my little Butterfly Easel Card that I have made this year. 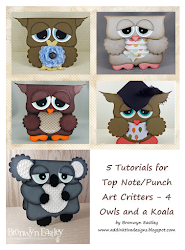 You can view my free tutorial HERE. 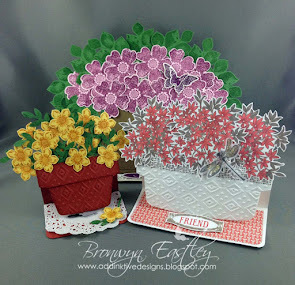 The one on the left was the original that I made for a UStamp with Dawn and Friends Project and shortly afterwards I made the River Rock, Cherry Cobbler and Daffodil Delight one for a colour challenge at Just Add Ink. After doing this post I'm inspired to go and make some more, as one lovely lady I met at the last Convention in Melbourne, has been patiently waiting for a swap from me! 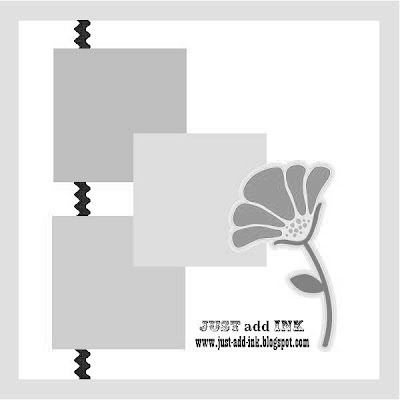 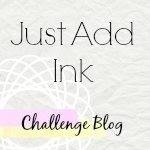 This week at Just Add Ink we have a colour challenge for you. 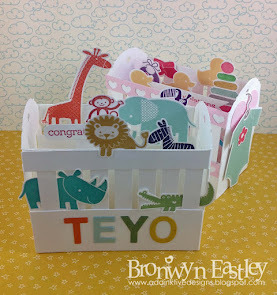 I had fun putting this combo together and to me it 'says' ... 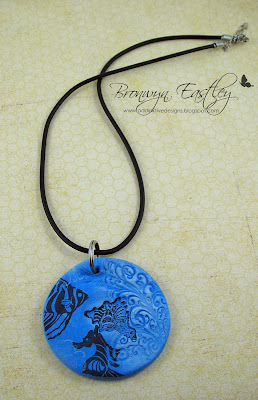 NATURE, so I got my Nature Walk stamp set all inky for the very first time and refrained from adding anything too girly to keep it gender neutral. 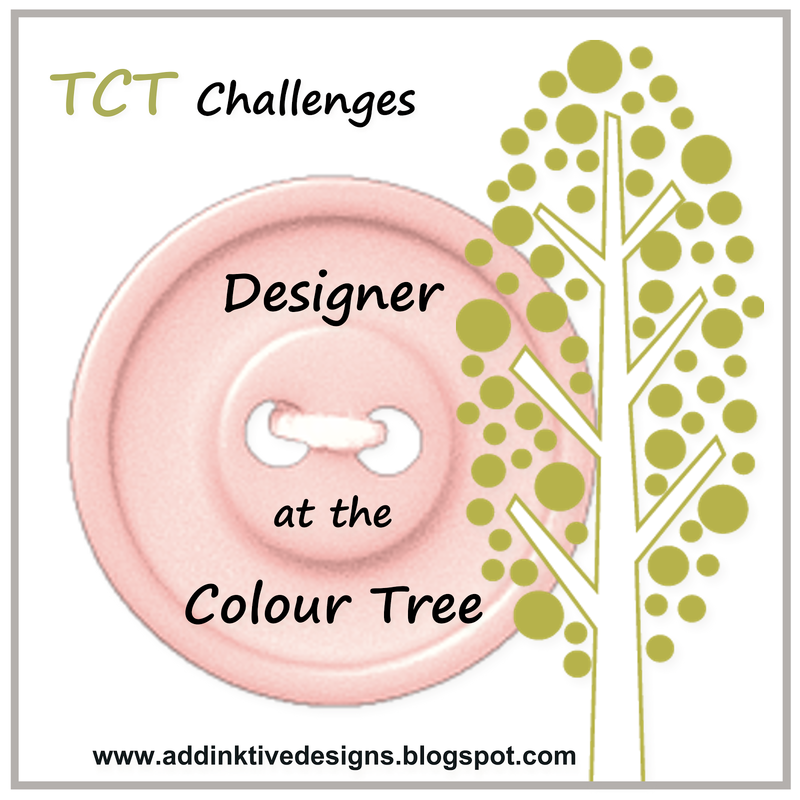 I hope the colours inspire you to play along. 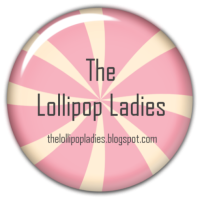 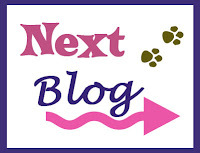 Hop on over to the JAI Blog to get some great inspiration from the other DT members and to link up your own entry. 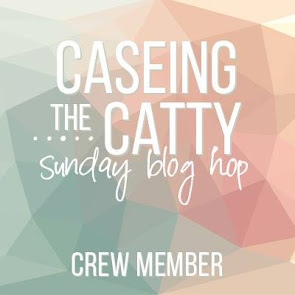 There hasn't been a lot of crafting or blogging from me lately due to the busyness of life and my mojo taking a 'hike', plus I've been frantically trying to sort out my craft room (Those that have dared to venture in there this year will know why). 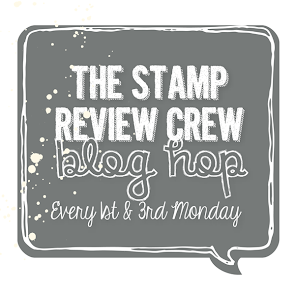 The good news is that most of my stamp stuff is sorted but I have other boxes of bits 'n' bobs that need my attention and I want to create more space so I can have friends round for stamp nights etc. Anyway, while I was tidying up, I came across some neglected stuff in my stash. I retrieved some Kaiser flocked pattern paper and matching flowers to quickly 'whip up' a card for the JAI sketch that I had designed. There's no stamping on this at all and I added some SU Rich Razzleberry Cardstock, Clear Rhinestone Brads and dimensionals to complete it. 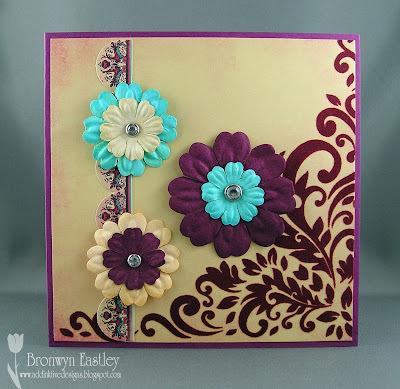 This is definitely not 'DT worthy' but it got me back in the mood to craft. 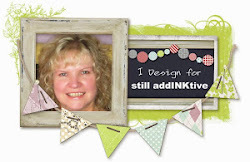 If you want to take part in the sketch challenge this week, hop on over to Just Add Ink, get inspired by the projects from the lovely DT girls and link up your own entry. It's been a while since the last post but I'm glad to be back stamping after a very hectic schedule with two weekends away and a very busy time at work. 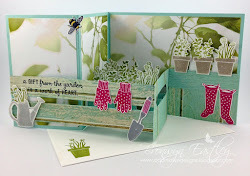 Delys has provided us with a beautiful inspiration photo for Just Add Ink's 76th Challenge and I thought I'd try something a little different this time around. 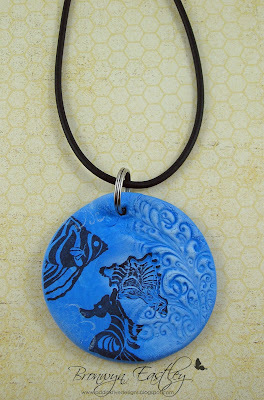 I bought some Paper Magiclay from a local craft shop and blended some dark blue and white clay together to form this gorgeous marine blue colour. I used SU's 'seaweed flourish' and small shell stamp from the set called, Ocean Commotion and pressed them into the rolled out clay to create a bit of 'debossing'. A drinking glass was used to 'cut out' the pendant shape and this was then attached to a split ring before leaving it to dry for the next 24 hours. 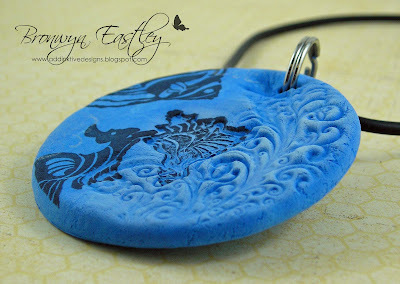 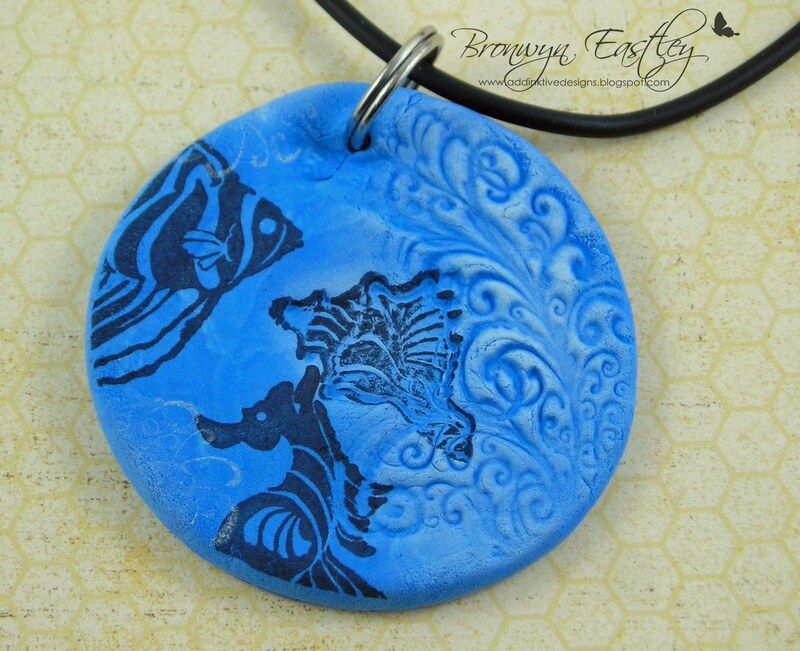 The next night, I sponged White Staz On over the 'seaweed flourish' to highlight the pattern on the clay and then used Black Staz On to stamp the remaining stamps onto the flat section of the pendant and the 'debossed shell'. 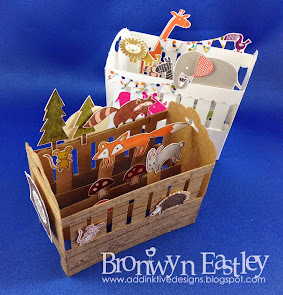 Paper Magiclay is so light and can also be used for some fun 3D embellishments for cards. 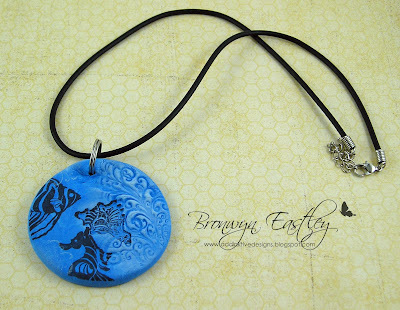 To make the pendant more durable I will eventually coat it with Crystal Effects. 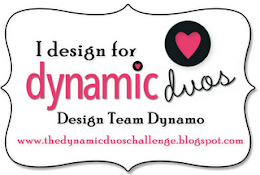 This challenge has brought out some amazing projects from the Design Team at Just Add Ink. 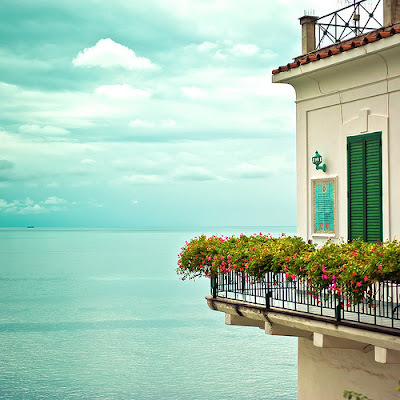 Why don't you hop on over there and take a look for yourself? 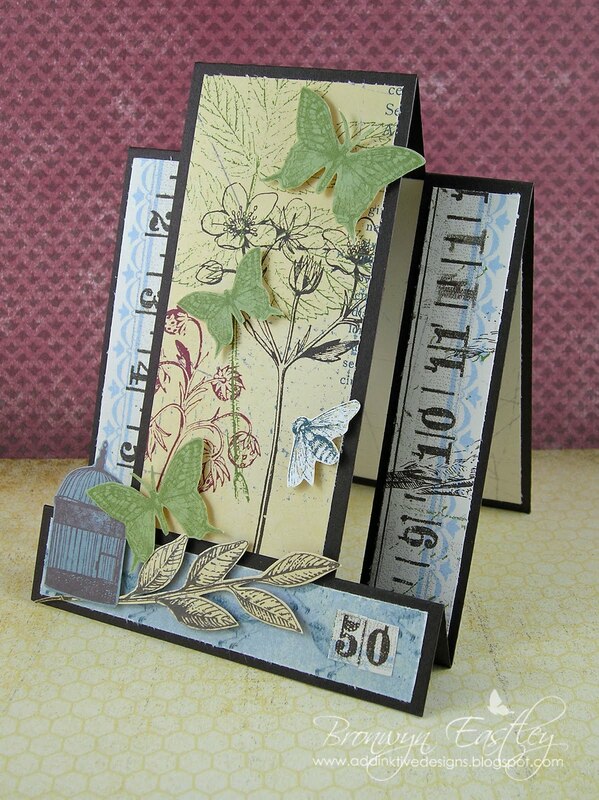 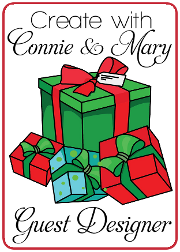 If you're doing the blog hop in order you would have been gob-smacked by Nikki Spencer's awesome Side Step Card. For my submission, I chose a Funky Fold (centre step) card which was really easy to make. 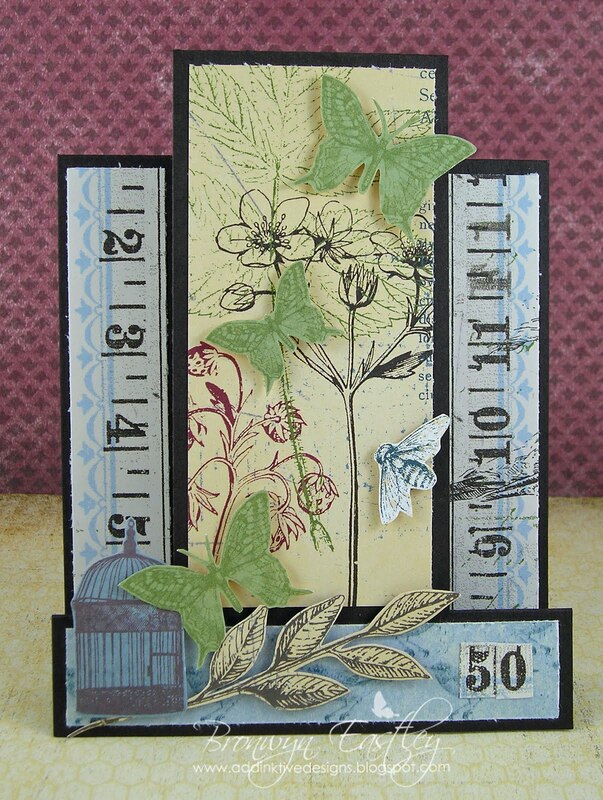 Would you believe that I only used DSP (Botanical Gazette), card stock (Early Espresso) and dimensionals? No stamping at all for this one. 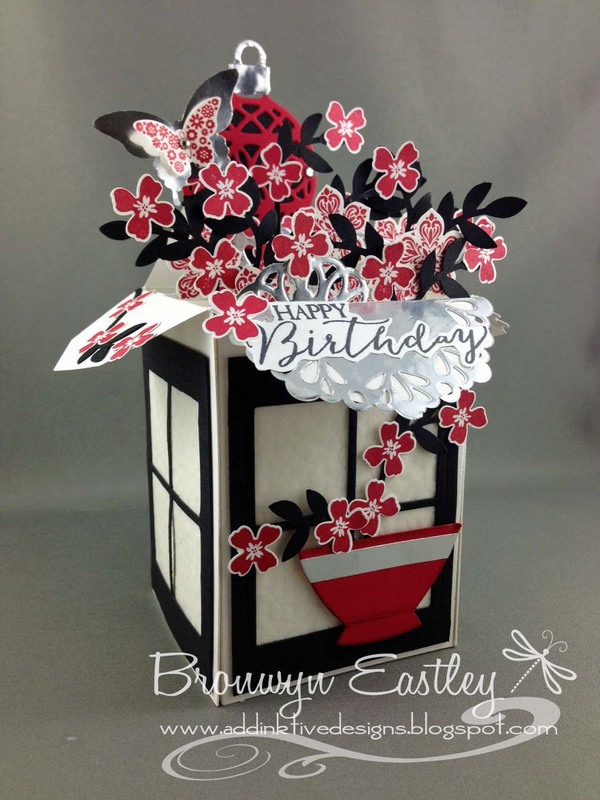 The fancy fold really gives it the WOW factor! 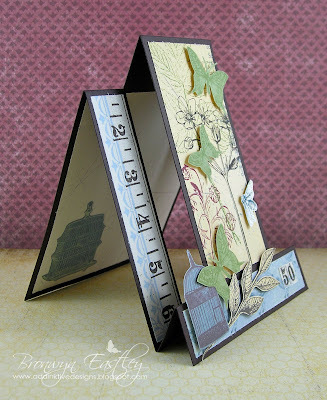 I was inspired by a Funky Fold card Laura Lipe made and she has easy to follow instructions/template on her blog which you can view HERE.